What are Kindle Countdown Deals? It allows readers and writers to take advantage of Kindle books that have been placed on sale from their original price. Want scone and jam recipes at a great price? The best selling “17-76 Tea Party Recipes – Award Winning Recipes” – a collection of 76 scone recipes and 17 Jams and Spreads is available as part of the Kindle Countdown Deals from November 15, 2013 through November 21st! It’s a really good deal and chock full of tried and true recipes from the Carnelian Rose Tea recipe collection, A Cuppa Countess Gourmet Guide and a lightweight family history. The foreword is written by the famous James Norwood Pratt (he might say infamous). Reviewers include tea and food historian, Judith Krall-Russo, Pat Jollota, Pat Stephens, and Ethan Harris. Photos are by Kate Singh, Aevum Images. Inside are jam and jelly recipes including Blackberry, Sage and Lavender, Chantilly Crème and Mock Devonshire cream. Scone recipes include Stilton Scones (with permission from Stilton in the UK), a basic scone recipe that was given to me by a chef at the Ritz Carlton in London and my sister’s Blue Ribbon biscuit recipe. 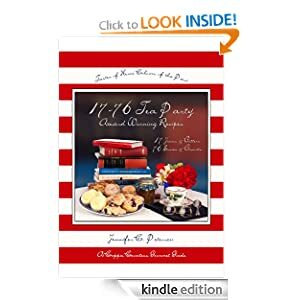 Buy “17-76 Tea Party Recipes” for only 99 cents on Friday, November 15th and each day the price goes up a dollar until the Kindle Countdown reaches the full price of $7.99 on November 21st. It’s a sale price every day! Kindle Countdown Deals is a new promotion by Amazon for customer appreciation. And for me, since there were formatting issues with the original Kindle publication, I’m practically giving away the Kindle version of my personal scone and jam recipes in appreciation of good customer service to me. It’s kind of a pay-it-forward idea. Love the recipes? Give is a big thumbs up with 5-star rating. Enjoy this Kindle Countdown deal. Have a wonderful day and Happy Baking!